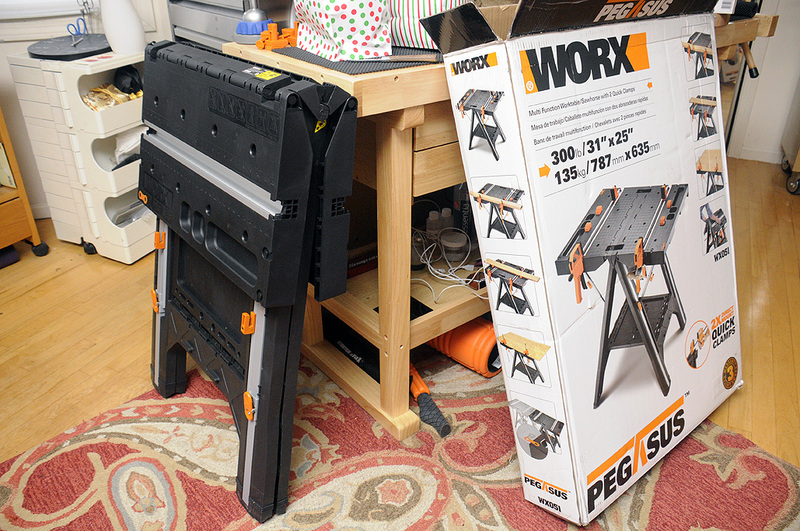 We “unwrapped” an awesome worktable from WORX this Holiday weekend. 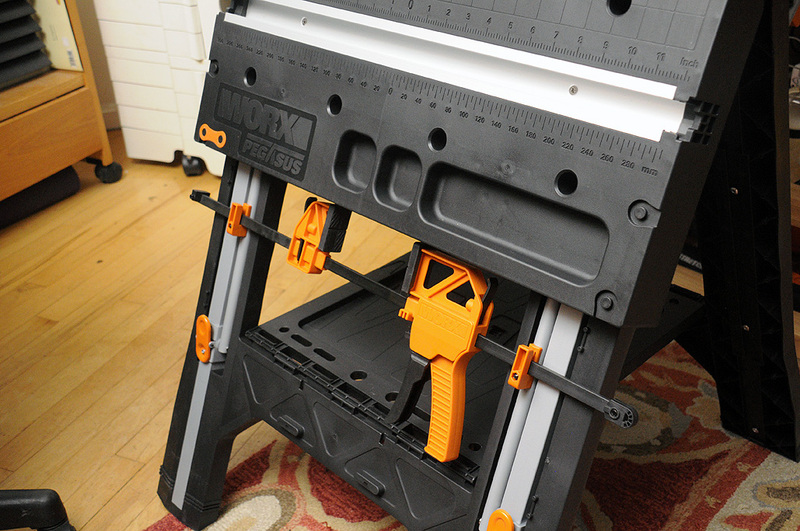 The WORX Pegasus is both a multi-function worktable and a heavy-duty saw horse. This table is perfect for the occasional DIYer, but would also serve those who have more demanding needs. Let’s take a closer FirstLook at this new addition to the RainyDayWorkshop! The table is shipped fully assembled, and is ready for use as soon as it is unpacked. Setup is so intuitive that it does not even come with directions. Its well-thought-out design makes the need for a user guide superfluous. All of the support mechanisms are either interlocking or embedded in aluminum tracks, and cannot become misaligned. To use the Pegasus as a table, just lift the panels up. Everything will automatically lock into place. The opened tabletop measures 31 x 25 inches (725 sq inches of work area) and stands 32″ high. 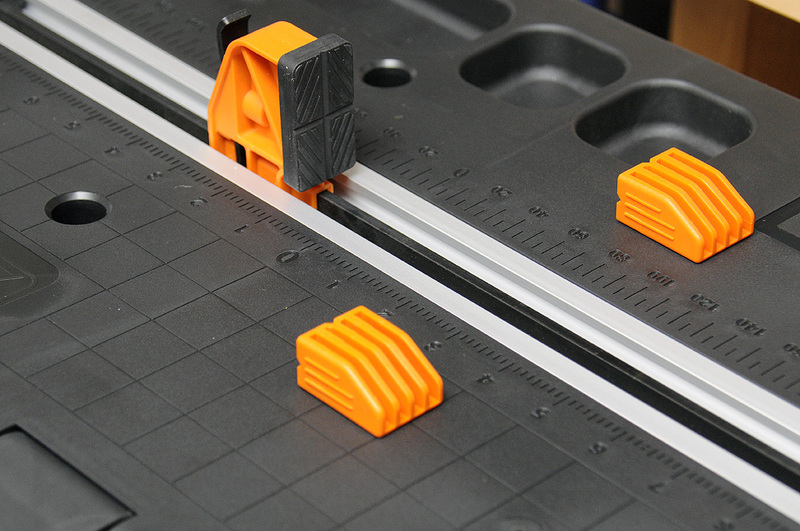 Molded onto the surface are all kinds of grids and ruler markings for convenience. Along the edges are strategically placed wells for holding screws and other small bits. Hanging on the legs of the table are the bar clamps. These bar clamps are specifically designed to fit the aluminum channels in the table top panels. 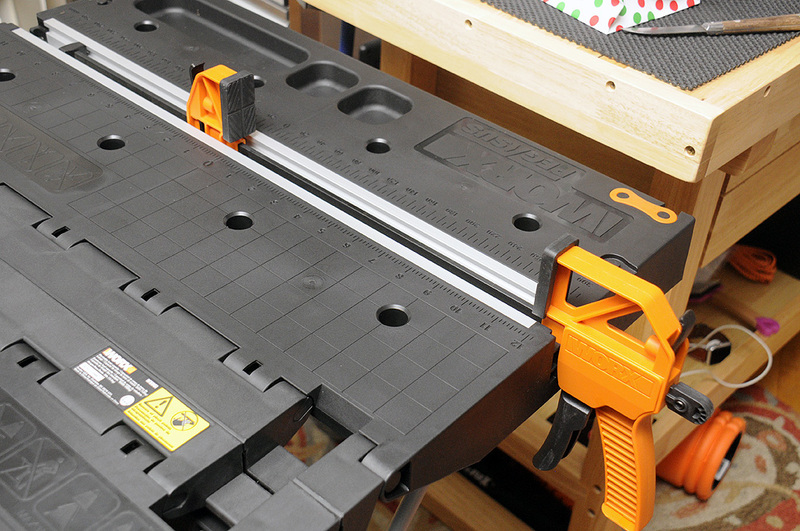 Once in place, the clamps may be adjusted to span the full length of the table. Working in concert with the clamp dogs, the surface can be hold in place a variety of odd add irregularly shaped work pieces, something which is difficult to do with similar tables of other designs. 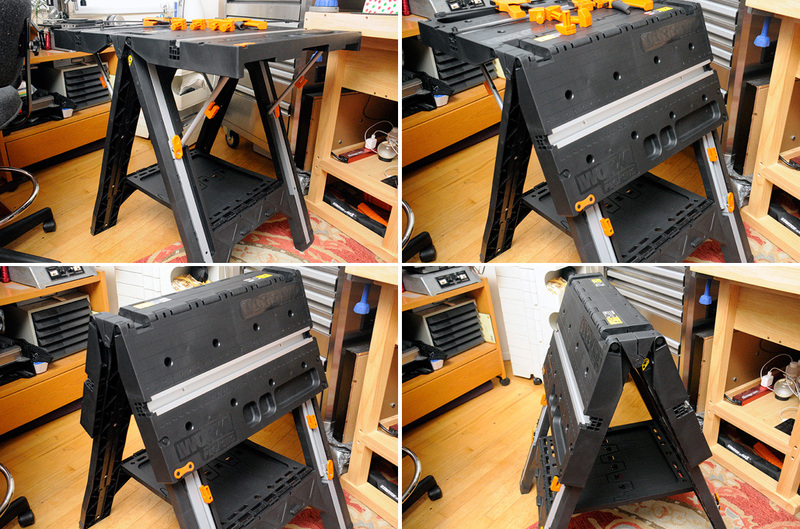 Changing the Pegasus to use as a sawhorse or to store it is just as simple. A quick press of the orange locking tabs on legs free the support guides, allowing the top to fold down. Molded into the top are two gaps sized to fit a 2×4 stud...very handy! 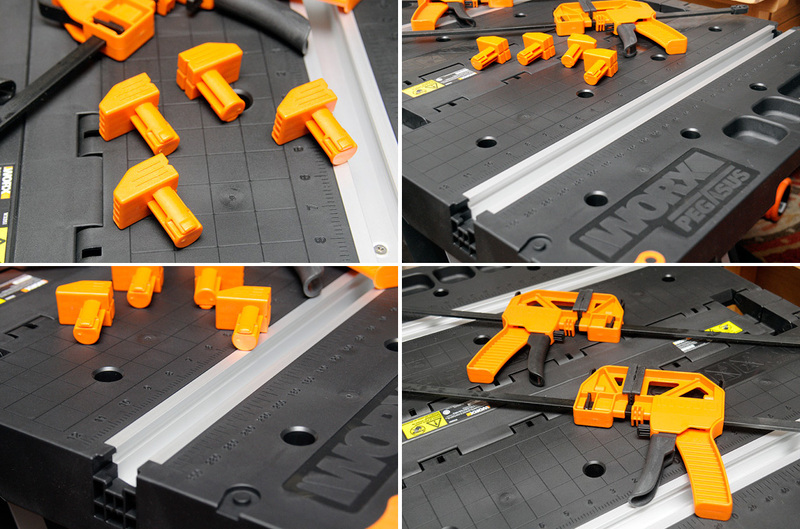 As part of its innovative design, additional Pegasus units may be connected to create a larger work surface. 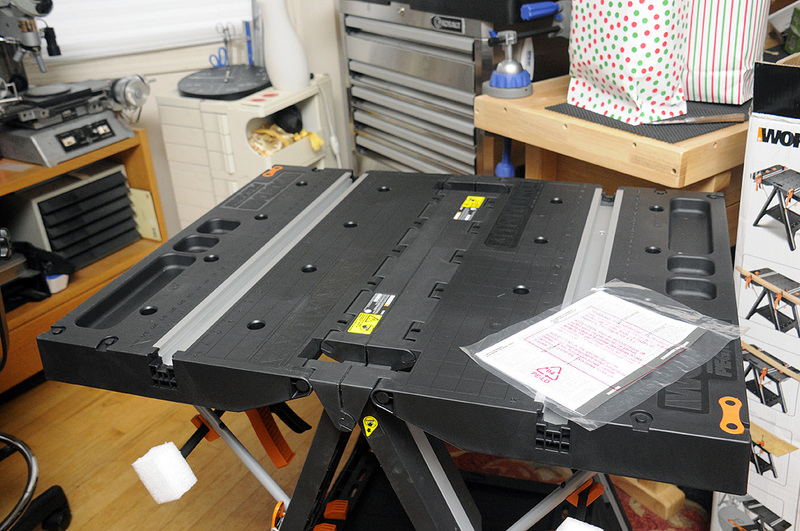 Also, the folding brace at the bottom doubles as a shelf, a handy place for tools and such while working. 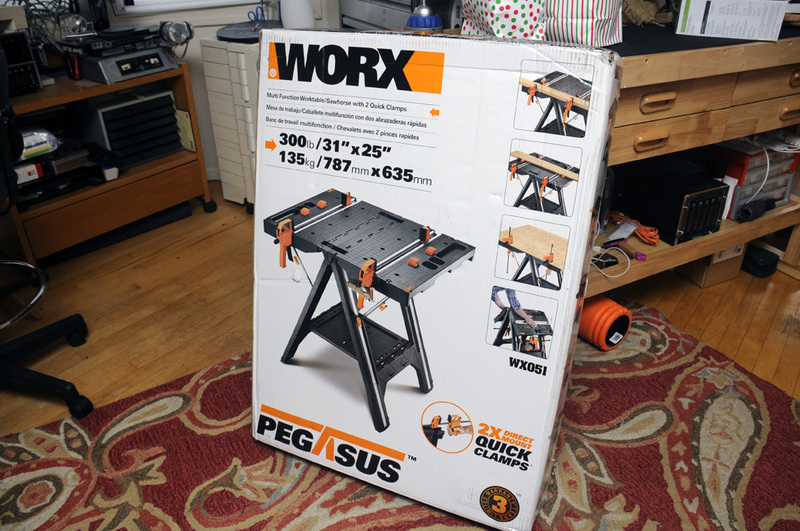 The WORX Pegasus is a great addition for all space-challenged DIYers and we can’t wait to put the Pegause to work! NOTE: We are excited about the addition of the WORX Pegasus to our workshop However, we are even MORE excited that the Pegasus may be the portable table we have been searching for so we can easily take our portable telescope and imaging setup out into the field! More on that soon.